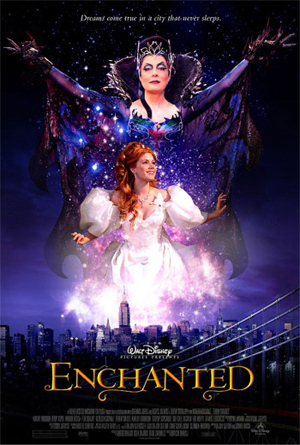 Trying to be witty, I shall say that Enchanted was an enchanting movie. It is cross between a Disney Princess classic and all those movies about young people trying to make it in New York City and getting some street smarts. The story goes that Giselle (played by Amy Adams) is a fair maiden from a Disney animated classic who fell in love with her prince (played by James Marsden) after only one day the two are about to get married. However the prince’s evil stepmother does not want to lose the kingdom and so, desguised as a little old lady, she pushes Giselle into a fountain and into Times Square in New York City in all her wedding dress glory. Sad that no one will help her, Giselle happens upon Robert, a divorce lawyer with a very no nonsense view of life. This movie was a delight. It blended Disney and real life pretty well and as I understand it was the number one movie in America for quite some time. Visual effects were decent and the musical numbers were good with lots of dancers and color and actually good singing. This movie was a joy to watch and one can’t help but “aww!” at the end when Giselle has to make a choice between the animated world and the real one.